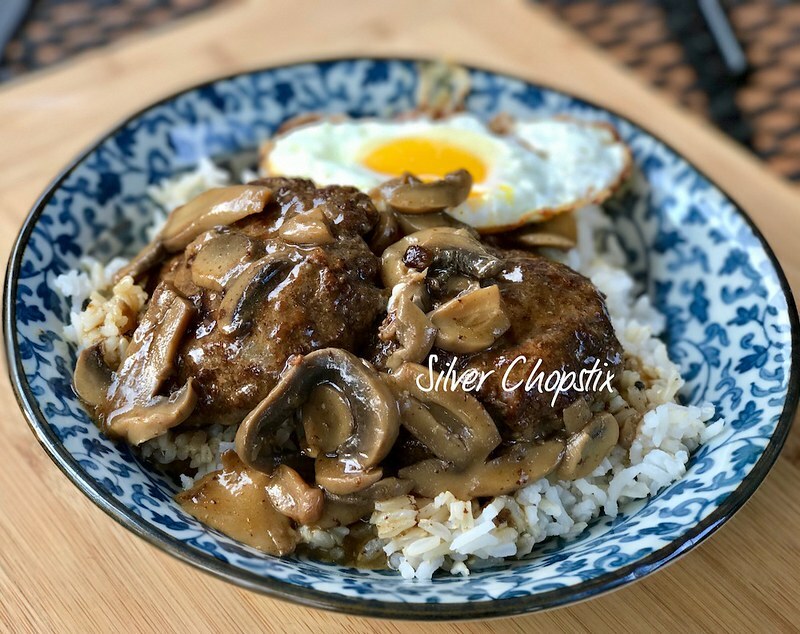 Loco Moco reminds me of Jollibee’s burger steak sans the fried egg. The recipe is almost exactly the same with the exception of the mushrooms in the gravy and of course the egg. This dish has been around since the 1940’s. Story goes that it was made by Nancy Inouye, the wife of the owner of Lincoln Grill in Hilo, Hawaii; at the request of some teenagers who wanted something other than the usual sandwich. This is a true and awesome fusion of Asian and Western cuisine. 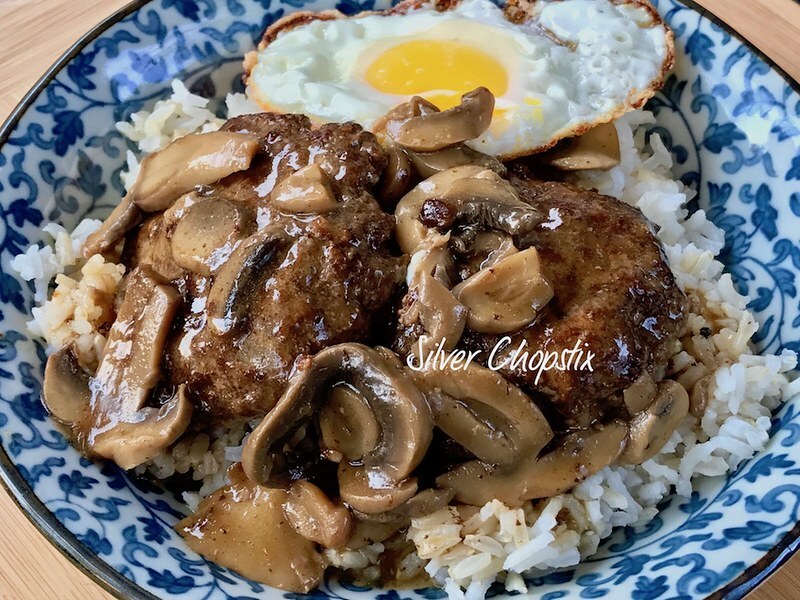 The combination of white rice and burger patties over some brown gravy and fried egg is the quintessential comfort food. To make this dish you will need 1-1.5 lb ground beef, 1 egg, 1/4-1/2 cup bread crumbs or panko, 1 medium sized finely chopped onion, 1-2 tbsp. worcestershire sauce, 1 tsp. salt and 1 tsp ground black pepper and 1 tbsp. Knorr liquid seasoning (optional). Place all your ingredients in a bowl and with your hands using food safe gloves mix well to combine. Divide your meat mixture into six equal parts. Take one portion of your meat and form it into a ball or patty then toss this back and forth in your hands like a baseball. Do this repeatedly about 5-8 times to ensure that there will be no air inside the patty, thus avoiding cracks while cooking. Then flatten it into a disk. Heat a non-stick pan and add 1-2 tbsp. vegetable oil. Then place your patties and cook for 5-6 minutes on medium to low heat until a nice brown crust is formed. Then flip your patties and cook for an additional 5-6 minutes. In the same pan, saute 1 medium sized finely chopped onion using 1-2 tbsp. of your pan drippings and cook until translucent. Then add 1 small can of sliced button mushrooms (fresh is ideal) and continue cooking for a few minutes. Add 1 1/2 cups of beef broth and let this come to a boil. Season with 1 tbsp. soy sauce and a few shakes of Knorr liquid seasoning or worcestershire sauce. To thicken the sauce, I made a slurry of 1 tbsp. cornstarch diluted in 2-3 tbsp of water. Slowly pour this into your gravy until you get your desired consistency. 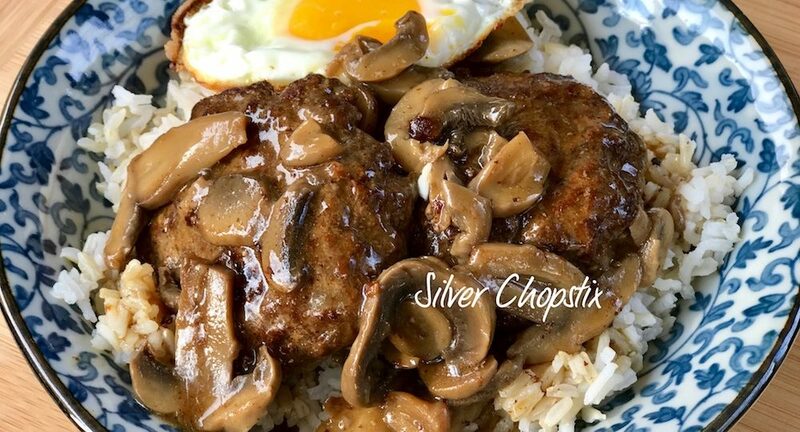 To serve, place some steamed white rice in shallow bowls, arrange 2 patties and generously pour some gravy. Top it off with a fried sunny side egg.